Off the Rack or Custom Tailored? Originally, all clothing was “custom” made. Made in the household, altered to be passed down from child to child. Centuries later, clothing was still custom made by professional dressmakers and tailors. Today, custom clothing can still be made by tailors and dressmakers for special occasions. Suits for gentlemen can be fitted is a couple of days, especially for travelers in foreign countries. Normally, these garments are priced higher than suits and dresses purchased in shops and department stores, that is clothing “off the rack”. When the industrial revolution introduced machinery and the factory system the clothing trade was changed forever. While custom made clothing remained for those who could afford it, the working classes could purchase clothing adapted and styled to be made by the thousands of garments shipped to catalog houses and department stores. Standardized sizes replaced exact body measurements and if one could not find garments in a favorite color or style, one only had to wait a season, and, sure enough, blue was in every store window and hem-lines shifted. Designers offered two lines: couture and off the rack. Fine tailoring shops can be found in nearly every large city. When seeing the sights in Vienna this past spring I encountered a small shop selling tailored made shirts. What caught my eye was their window display of a shirt pattern and an assortment of optional collars. Within the shop were shelves of beautiful fabrics in pinstripes, checks and pastel solids. The price seemed a bit steep, over 300 Euros. 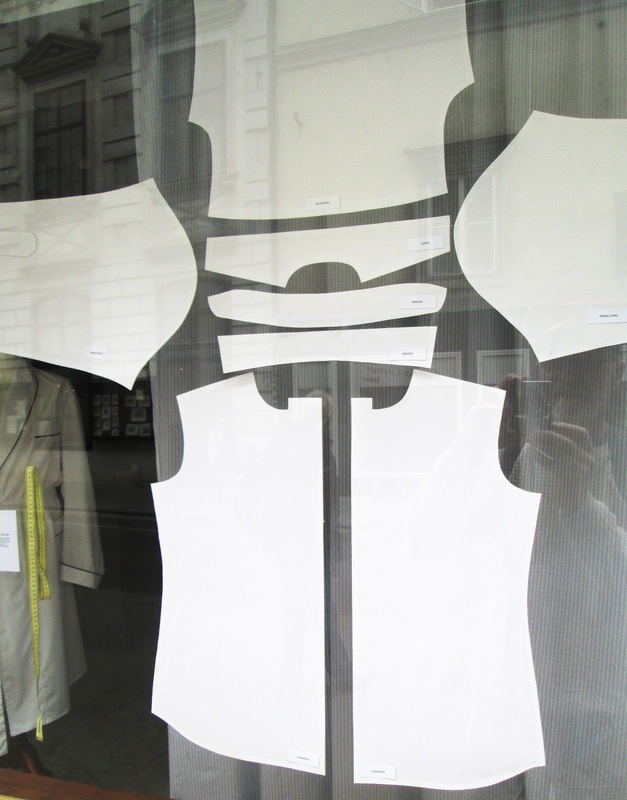 Shop window display of a custom shirt pattern. Shop display of optional collars. Then when I returned home I found an article in one of my favorite fashion sources, The Wall Street Journal. In the Style and Fashion section, Saturday/Sunday, May 30-31, 2015 I read an article, ”The Shirt of the Summer ” featuring collarless dress shirts. The prices for these mass produced shirts ranged from $195 - $425. I see now that off- the- rack is approaching the league of custom-made.